Some people in life know exactly what they want to do from the moment they are born. For me, it has been more of a directionally correct journey with various course corrections along the way. But after over 25 years working on numerous issues of corporate social and environmental responsibility, I am excited to dedicate myself full-time to a focus area that has become my true passion. For the past 8 years, I have taken leadership roles in the development and launch of several global conflict minerals initiatives, including the Conflict Free Sourcing Initiative (CFSI), Public Private Alliance for Responsible Minerals Trade (PPA), Solutions for Hope (SfH), and Conflict Free Tin Initiative (CFTI). With that background, I recently left my employer of over 25 years to launch Responsible Trade, LLC – to help corporations, both upstream and downstream, implement responsible trade policies and practices within their supply chains. Initially, Responsible Trade, LLC will support entities wishing to implement practical due diligence when the products they produce contain any tin, tantalum, tungsten, or gold – the most commonly recognized minerals associated with conflict. We will provide support along the supply chain from the mine, to the brand company, and at all levels in between. In addition to the compliance and audit aspect, the company will also support the development and implementation of systems that source from conflict affected and high risk areas and connect the supply chain actors to help provide assurance that these materials are truly responsibly sourced. There is a need to continue to build systems and programs that will allow legitimate conflict free materials from the DRC and other areas affected by conflict to enter the global market. This need is even more pronounced now that the EU is drafting regulations that apply to any “high risk” or “conflict affected” areas worldwide, far above and beyond the U.S. Dodd-Frank regulation, which applies to the Democratic Republic of Congo and adjoining countries. 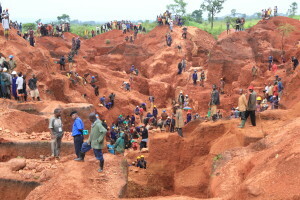 Without strategic interventions, artisanal miners in these countries – even those operating legally and free of conflict – could lose their livelihoods. I am excited to help industry stay engaged in these areas and to use the lessons learned over the past eight years to shorten the learning curve. I’m eager to help organizations implement proven approaches and create the needed changes to contribute to peace-building, support responsible artisanal mining, enhance their own due diligence processes, and improve their bottom lines in the process. I am excited to start on this journey and look forward to advancing responsible trade throughout all forms of supply chains. Mike can be reached at MikeLoch@ResponsibleTradeLLC.com .